Bed bugs are animals that are mostly active at night. They feed on the blood of mammals and birds. They hide in cracks and crevices and live in groups and clusters when not in feeding. These places are usually near their victims as this allows them to quickly escape after sucking their blood. Some of the common places they are found include bed sheets, mattresses, bed frames, especially wooden bed frames as bed bugs tend to prefer wood or paper as compared to metal surfaces. 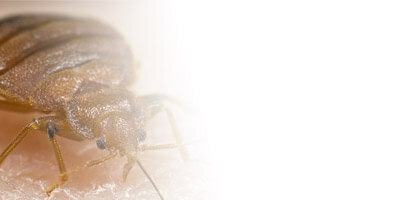 A female bed bug usually lays one to five eggs a day which hatches within 6 to 10 days. Bed bugs can be a nuisance because they disrupt the sleep of humans with the bites on their face, neck, arms, legs while they are asleep. A wheal is formed as a common response after being bitten, which is a spot of swelling at the attacked area of the skin due to an allergic reaction. Itching is followed on thereafter which may last for several hours. In more severe cases, asthmatic symptoms occur, and if the affected area is near the eye, the eyelid maybe swollen shut affecting vision. Other problems include constant agitation, sleeplessness and nervousness. Our service technician will carry out a thorough inspection on the premise to find out where the source is at, especially anything close to the bed, like the mattresses, bed frame, sheets and other possible furnishings. Cast skins, faecal spots might be very noticeable in severe cases, as well as large clusters of bedbugs. A flushing agent will be applied, followed by residual spraying at the infested area throughout the premise. It is advisable to frequently vacuum the area to help eliminate the bed bugs. To prevent cross infestation, the vacuum cleaner bag should be tied in a plastic bag before disposal. Laundering bedding and clothing in hot water would also be a good preventive measure. There will be a follow- up visit from us 7-10days after the initial treatment to ensure the effectiveness of the control. A flushing agent will be used during follow-up inspection and residual spraying will be carried out should there be any active bed bugs upon detection still. To know more about these services, please contact us.